In November 2018, the United States exported a historic 2.6 million barrels of crude oil per day to become the world’s fifth largest exporter of crude oil. 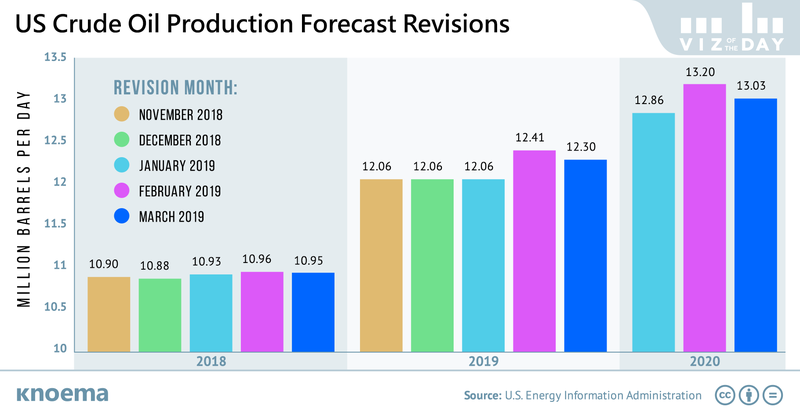 While the US is on track to maintain this historic volume of production during the next couple of years, the EIA in March tempered its February production growth forecast, issuing a 0.9 percent downward revision for 2019 and 1.3 percent revision for 2020. The current forecast predicts average 12.3 million b/d production this year and 13 million b/d in 2020, while the previous average estimates were 12.41 and 13.2 million b/d, respectively. EIA revised oil production down as the number of active oil rigs in the US is decreasing as many wells are drilling out fast. As of the week ending March 22, the number of oil rigs in the US was 824, which is 64 rigs less than in November. Market observers track production forecasts closely to glean insights into global inventories and ultimately prices. Below we offer data visualizations to help you learn more about current US energy production and market dynamics.